The Martian moon Phobos as seen by the Mars Reconnaissance Orbiter's HiRISE camera on March 23, 2008. 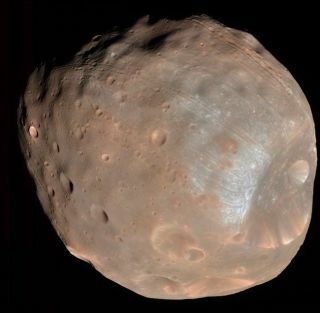 One of thebest close-ups ever taken of the Martian moon Phobos reveals fresh details ofthe strange object. The impactcrater named Stickney is the largest feature on Phobos with a diameter ofalmost 6 miles (9 km). The crater wall textures come from landslides thatformed as materials fell in the weak gravity of the moon. A series ofgrooves appear to radiate outwards from the crater, although studies have shownthe cracks did not come from the crater. Some scientists believe the groovesare still related to the origin of Stickney, but others speculate that theyoriginated with leftover space debris from Martian impacts that later pelted Phobos. Just 13.5miles (22 km) wide, Phobos appears as a lumpy,imperfect moon because its weak gravity could not compact it into a sphere.Both Phobos and its sister moon Deimos seem very similar to some asteroids,which could suggest their origin as space rocks captured by Martian gravity. Otherorigin theories for the Martian moons include coming from a largermoon that broke up, forming with Mars in the early solar system, or beingcomposed of material blasted from the Martian surface by impacts. The MarsReconnaissance Orbiter (MRO) angled in as close as 3,600 miles (5,800kilometers) to eye Phobos in detail. Two similar images taken from differentdistances were combined to give the perceptionof a 3-D view. Spacecraft such as Mars Global Surveyor have taken closer images of Phobos, butMRO's HiRISE camera provides some of the best quality data to date for theMartian moon. Although nospacecraft have landed on Phobos, the Russians announced plans in 2005 todevelop a Phobos-Gruntmission to collect soil samples.